Warren Lehrer is a writer, artist and performer known as a pioneer of visual literature and design authorship. Acclaimed for capturing the shape of thought and reuniting the oral and pictorial traditions of storytelling with the printed page, Lehrer has received numerous awards for his books and multimedia projects including: the Brendan Gill Prize, the Innovative Use of Archives Award, three AIGA Book Awards, a Media That Matters Award, and grants and fellowships from the NEA, NYSCA, NYFA, Rockefeller, Ford, and Greenwall Foundations. His work is in many collections including MoMA, The Getty Museum, Georges Pompidou Centre, and Tate Gallery. Lehrer is a Full Professor at SUNY Purchase, and a founding faculty member of the Designer As Author grad program at SVA. With Judith Sloan, he co-founded EarSay, an arts organization in Queens, NY dedicated to uncovering and portraying the lives of the uncelebrated in print, on stage, on the radio, in exhibitions, concert halls, electronic media, and through educational programs: www.earsay.org. Lehrer is also a playwright, performer and frequent lecturer and keynote speaker. His recent illuminated novel, A LIFE IN BOOKS: The Rise and Fall of Bleu Mobley has received nine awards including The International Book Award for Best New Fiction, the IPPY Outstanding Book of the Year Award, and a Print Magazine Design Award. A LIFE IN BOOKS: The Rise and Fall of Bleu Mobley (Goff Books, 2013) is an illuminated novel containing 101 books within it, all written by Lehrer’s (fictional) protagonist who finds himself in prison looking back on his life and career. The novel pairs Mobley’s reluctant memoir—as whispered into a taperecorder from the darkness of his prison cell—with a review of all 101 of his published books. Each of Mobley’s books is represented by its first edition cover design and catalogue copy, and more than a third of his books are excerpted. The resulting retrospective contrasts the published writings (which read like short stories) with the author’s confessional memoir, forming a most unusual portrait of a well-intentioned, obsessively inventive (if ethically challenged) book visionary. The book is offset printed, 4 color, hardbound, smythe sewn, 380 pages. 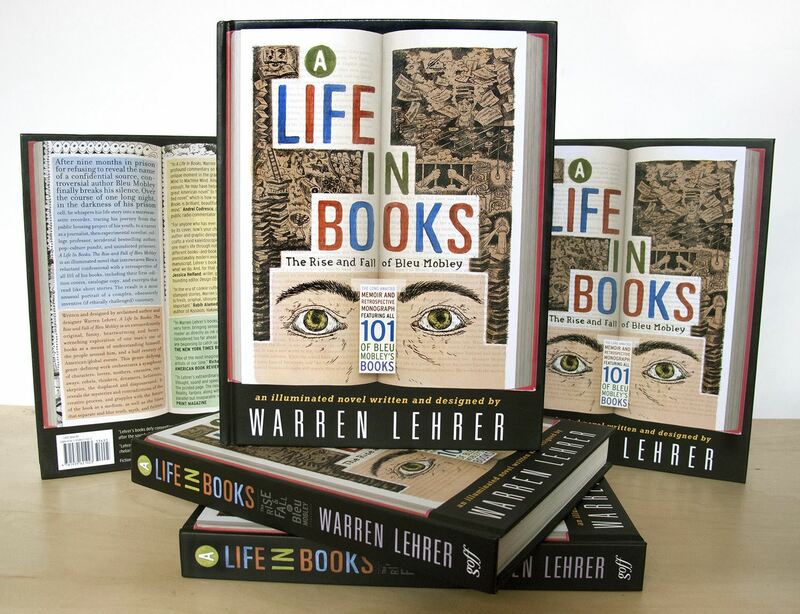 Lehrer is touring with a multimedia A Life In Books performance/lecture which incorporates videos and short films. For more information, visit www.alifeinbooks.net. 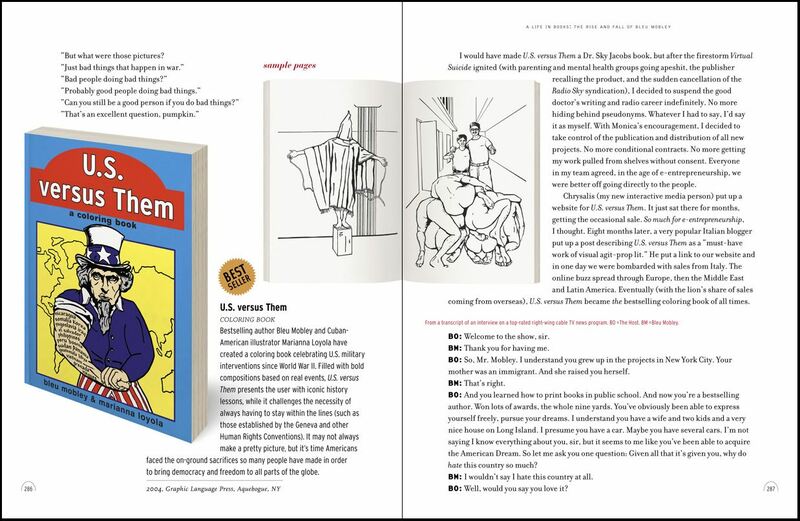 This 2 page spread from A Life In Books features U.S. versus Them, a coloring book by Bleu Mobley celebrating U.S. military interventions since World War II. It may not always make a pretty picture, but (according to the jacket copy), its time for Americans to face the on-the-ground sacrifices so many people have made in order to bring democracy and freedom to all parts of the globe. A short trailer for Bleu Mobley’s line of book lamps entitled Illuminated Manuscripts that can add a warm, literary feeling to any home (whether you read or not). The lamps illuminate the origins of storytelling, the nature of inspiration, the submersive and transcendent experiences of reading, the fusion of old and new technologies. From A Life In Books. 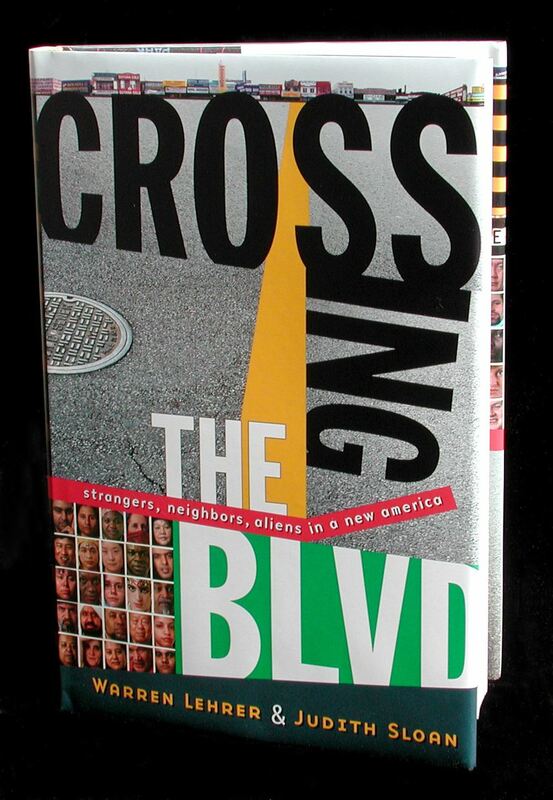 Crossing the BLVD: strangers, neighbors, aliens in a new America (W.W. Norton) is a 400 page, four color book that portrays stories, images and sounds of new immigrants and refugees who live in the most ethnically diverse locality in the United States—Queens, New York. For three years, Lehrer and his wife Judith Sloan traveled the world by trekking the streets of their home borough in search of migration stories, culture and soul. The Talmudic structure of the book juxtaposes multiple perspectives: neighbors who came from opposite ends of the earth, intergenerational points of view within families, teammates, classmates, friends, enemies, and co-workers. The 79 narratives are annotated by Lehrer/Sloan’s observations, as well as historical perspectives on the countries of origin, changes in U.S. foreign/immigration policies, and other contextual matter. Stories reflect upon crossing oceans, borders, wars, economic hardship, cultural divides. Collectively, their stories serve as a magnifying glass for the future of America. The Crossing the BLVD project also includes an audio CD, a series of public radio documentaries, a performance, and a traveling exhibition (that has so far toured to 15 sites around the country). 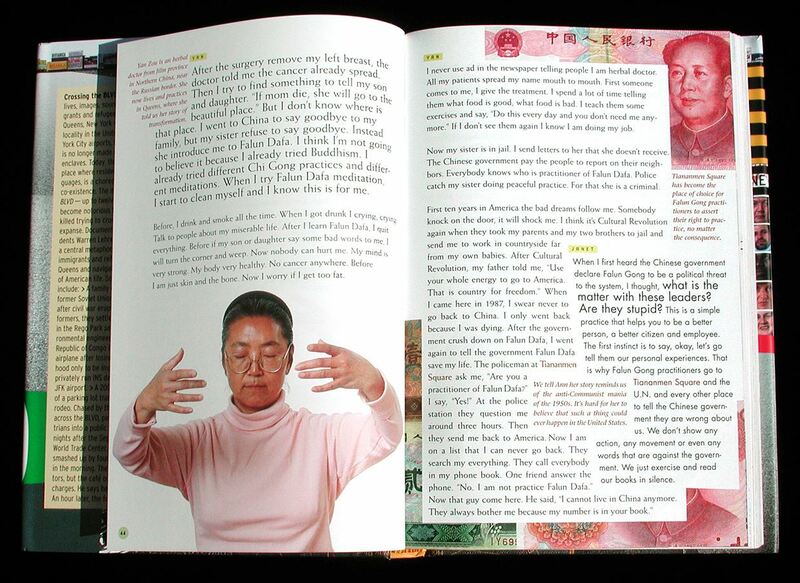 Spread from Crossing the BLVD, from the story “Six Women of Falun Gong.” On this spread two women describe how Tiananmen Square has become a place where Falun Gong practitioners go to openly defy the edict against doing their exercises in public. 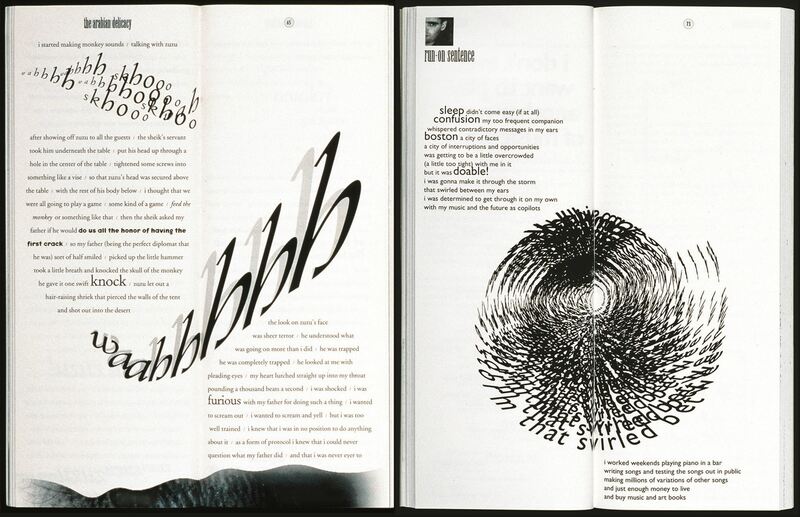 Two spreads from Lehrer’s The Portrait Series (Bay Press, 1995), a suite of four books portraying American eccentrics. Each book, proportional to the size of the human figure, features a photographic portrait of the person standing on the front cover, a portrait of them from the back on the back, and inside the guts: first person monologues and short stories, prayers to god, lists, etc. On the left, a spread from Claude: a narrative portrait of Claude Debs, and on the right from Charlie: a narrative portrait of Charlie Lang. 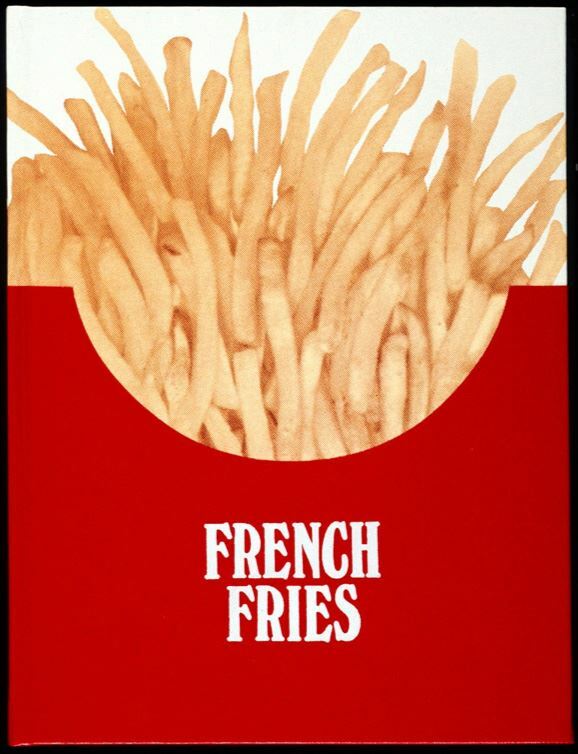 French Fries cover. (Visual Studies Workshop Press/EarSay, 1984) written by Dennis Bernstein and Warren Lehrer, designed by Lehrer. This book/play presents a day in the life of the original DREAM QUEEN (fast food) restaurant. Before the book/play begins, 83-year-old Gertie Greenbaum is found dead in a pool of blood and ketchup. Four customers and three employees (each set in his or her own typographic voice and color) give testimony to how Gerite died, and continue their day discussing food, money, religion, politics, love, loss, dreams, memories, and fading aspirations. The text is illuminated with icons and images that evoke the fast food tableau, and the internal projections of the characters. Color separation by Phil Zimmermann. French Fries spread from a section in the play when it is revealed that everyone is either working on a book or has a book within them. 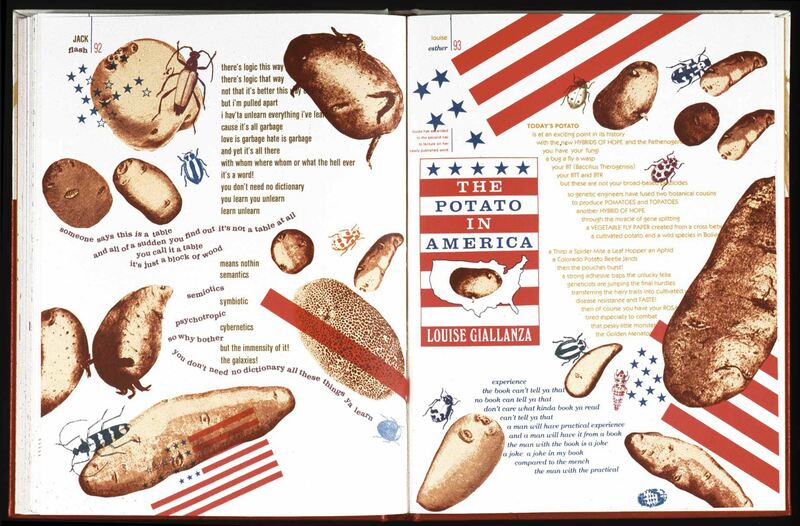 Louise Giallanza’s book The Potato in America predicts “genetic hybrids of hope” like pomatoes and topatoes, and genetically engineered potatoes that repel aphids and other pests without pesticides. Spread from i mean you know (1983, Visual Studies Workshop). This book/performance score takes place within a few hours of one day inside the minds of seven characters who co-inhabit the same building. The musical/ theatrical setting juxtaposes interior narratives of disparate characters into various arrangements: solo, duo, trio, quartet, sextet, and septet. 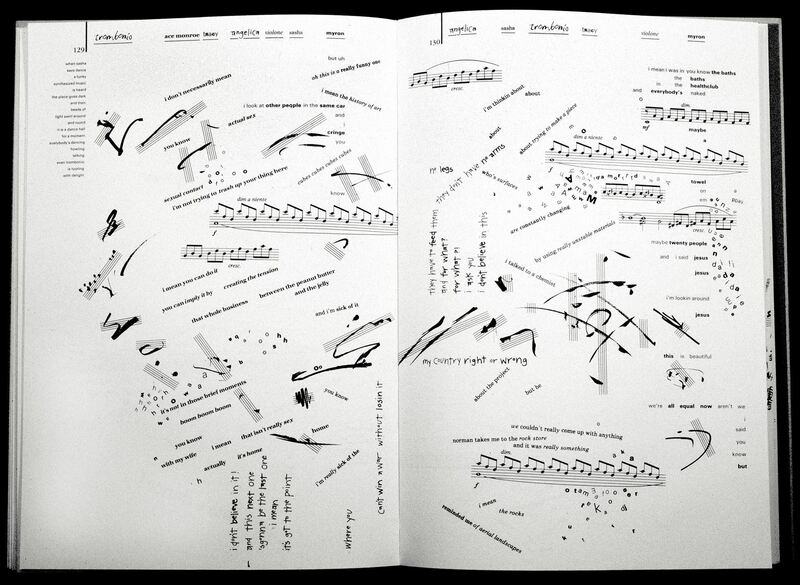 Lehrer’s second offset-printed artist book furthered his approach to using typography as a means of creating graphic representations of character with a particular focus on those synaptic gaps between thoughts and speech—in search of meaning (i mean) and a desire to connect with others (you know). A page from a new book-in-progress of short visual poems, titled Stretch Marks (2015/2016), written by Dennis Bernstein, visualized by Lehrer. 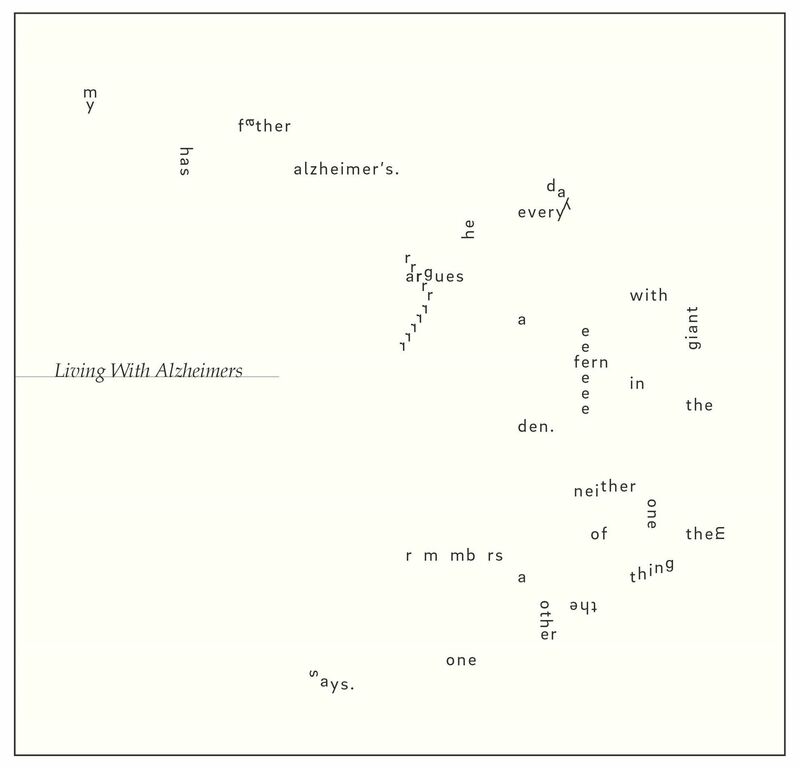 Living With Alzheimers is one of 250 poems. This work will be published both as physical book and as an iPad app with animations and interactive elements.